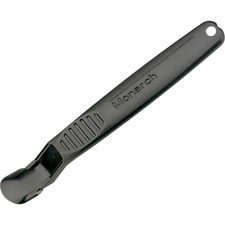 This plastic label scraper is ideal for removing hard-to-get-off sticky labels without scratching the surface they are on. Just hold scraper's handle in palm of your hand with your index finger on the blade. Hold blade flat to surface containing label and with a forward motion slide blade under label and remove. Scraper is made with a high percentage of recycled material.